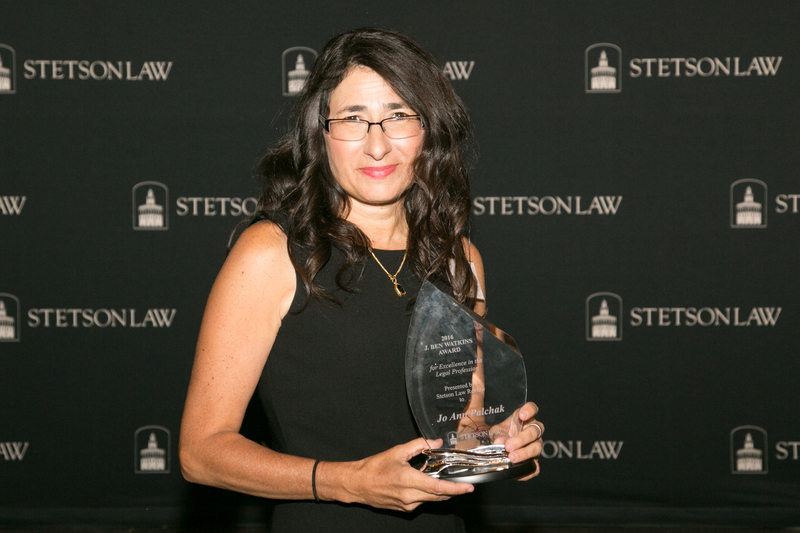 Jo Ann Palchak received the J. Ben Watkins Award at the Stetson Law Review Banquet. Jo Ann Palchak J.D. ’05 was honored with the J. Ben Watkins Award for excellence in the legal profession at the Stetson Law Review banquet on Nov. 19 in Gulfport. The J. Ben Watkins Award honors individuals who have demonstrated outstanding leadership and accomplishment in the legal community. Palchak is a criminal defense attorney in Tampa who specializes in representing individuals and companies in criminal investigations and prosecutions, as well as in complex civil litigation. She represents clients in misdemeanor and felony proceedings in state and federal court and counsels clients seeking appellate or post-conviction relief. Palchak’s defense of juveniles encompasses matters on and off school campuses. She is a life member and board member of the National Association of Criminal Defense Lawyers who has been selected as a Leader in the Law by the Florida Association for Women Lawyers, recipient of the Outstanding Pro Bono Service Award and Pro Bono Service Award from the Thirteenth Judicial Circuit, and the Marcelino “Bubba” Huerta III Award from the Hillsborough County Bar Association. The award is presented in honor of the late J. Ben Watkins LL.B. ’49, who helped found the Stetson Law Review and was a member of the Stetson Law Board of Overseers. Previous recipients of this prestigious award include outstanding members of the judiciary and bar leadership.